We've ditched the fax. Please use email or the phone to Contact Us. CMC Collection features distinctive accessories for today's home. We use one-of-a-kind modern, vintage and antique silk fabrics from around the world to create pillows, throws, table dressings and wall art. We offer unique designs that will compliment styles from casual chic to contemporary to traditional to transitional. All of our items are of the highest quality and individually crafted in our U.S workroom. Each item is a one-of-a-kind design with trims and backings individually selected to add to the style and uniqueness of each piece. Our products are sold primarily through high-end showrooms to interior designers and discriminating retail customers. We also sell through our web site and several other selected web sites. We can provide custom design services for clients with specific style or color needs. We have a large selection of silk fabric types in stock which can be made to order. Please contact us to let us know your requirements and we will send pictures of available fabrics, styles and trims that meet your needs. 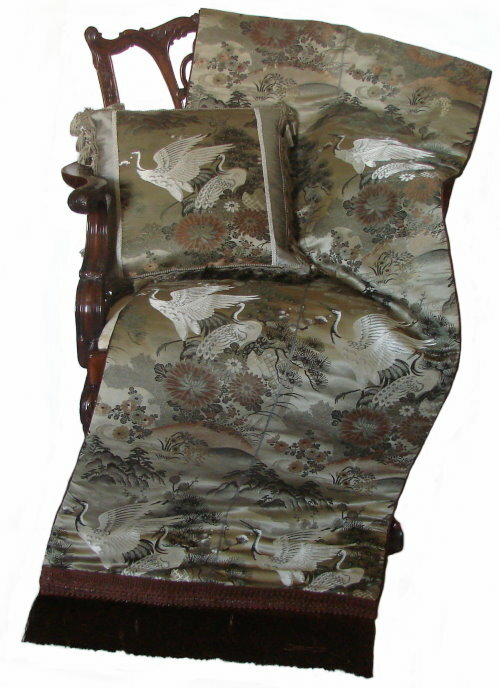 Click Product info to see examples of how you can use these exotic textile accessories to decorate your home or office. © Copyright CMC Collection. All rights reserved.